Despite shooting with their iPhones, photographers love to get out in front of traditional controls like ISO, shutter speed, white balance and bracketing without getting cross-eyed having to decipher teensy icons. Manual, from Little Pixels, is a new camera app for iOS that lets you control all the important settings with easy-to use popup slider bars. While the new camera app in iOS 8 gives you more control than ever for focus and exposure, that’s not saying much if you’re looking for precision. Manual has a natural feel. You can operate the app in either portrait or landscape orientation — the controller icons elegantly flip to the correct orientation — and the first thing you see upon launching the app are the bars of a histogram showing you how the light is distributed in your scene. 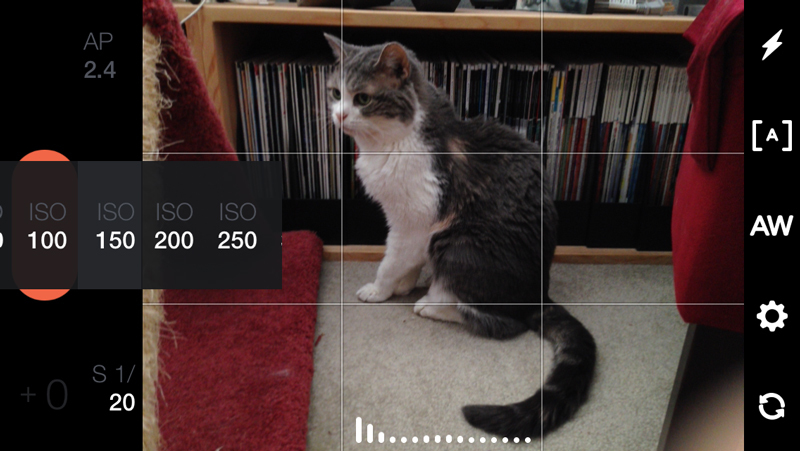 The histogram changes as you move the camera around, as it should. Popup menus let you dynamically control the shutter, ISO, white balance, focus and exposure bracketing. Just tap and slide and you can see how the controls change the scene on the display. It’s like a touch screen live view, only better because it’s easier to handle and more flexible. You can set the white balance and the flash settings, including a flashlight-based fill flash. 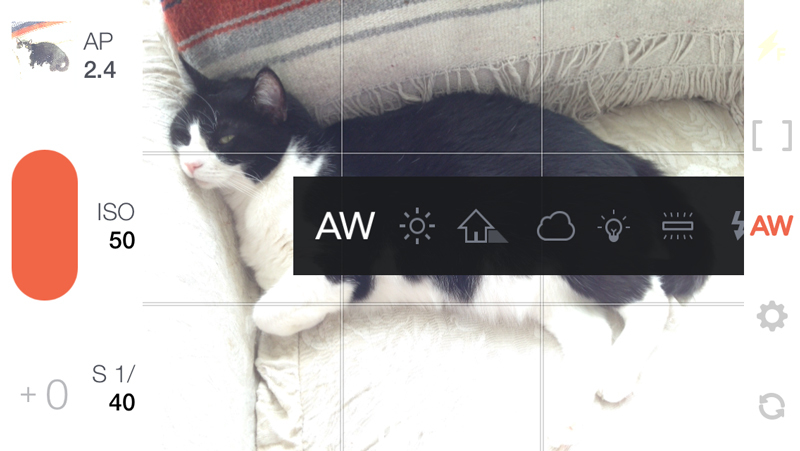 A light or dark theme, rule of thirds composition grid and EXIF viewer complete this elegant and useful app. Photos are automatically saved to the phone’s Photos app. You can put Manual in auto mode too, and tap for exposure and focus just as you would with the iPhone’s native camera. 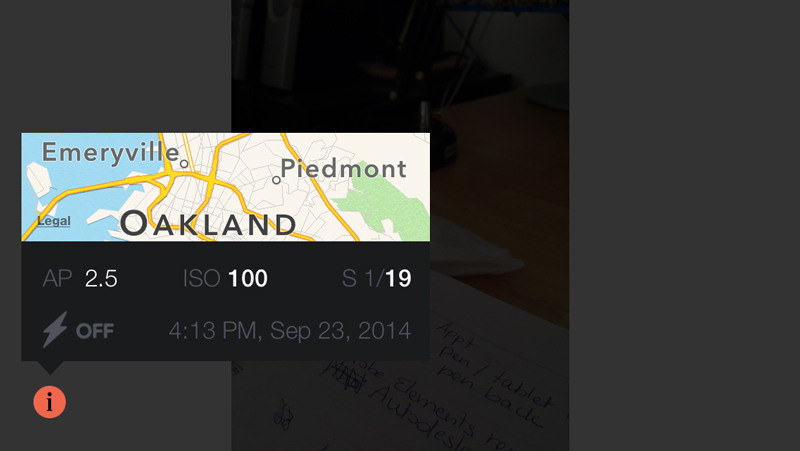 Plus, in auto you can also use the exposure bracketing feature. It’s nice to know what you’re doing when using Manual, but not strictly necessary. If you like what you see, just tap the big orange button. Manual is available on the iTunes Store for $1.99.